So this week’s blog is in the form of a diary about a trip we just took to Florida – well Fort Lauderdale and Miami…. We flew from Governors Harbour with Silver Airways to Fort Lauderdale – and this time it worked a treat. The flight was on time and we got through passport control swiftly and efficiently. Picking up bags and getting through the next bit was a bit more long winded but soon we were picking up our rental car and heading to our hotel – the Sonesta right on the end of Sunrise Boulevard looking right over the ocean. Rental car – $40 per day !!!! That first night we went to a restaurant that I had been to once before – a fantastic Italian restaurant called Valentino’s on Federal Highway. The food here is first class – you can mainly forget the menu – the daily specials are what to go for. I had cuttlefish – so tender it melted in your mouth with a spring vegetable selection of broad beans and minted peas – absolutely delicious….. My main course was spaghetti with Alaskan crab and baby roasted whole tomatoes – lightly spiced it was totally divine. Bob ate octopus as a starter and then pasta with lamb sauce . For desert we shared the most amazing tiramisu – it looked like a peach on the plate – so intricately decorated it was like eating a work of art ! We enjoyed the meal so much we tried to book for Saturday night as well but sadly for us they were fully booked…. Best and artiest tiramisu at Valentino’s restaurant. 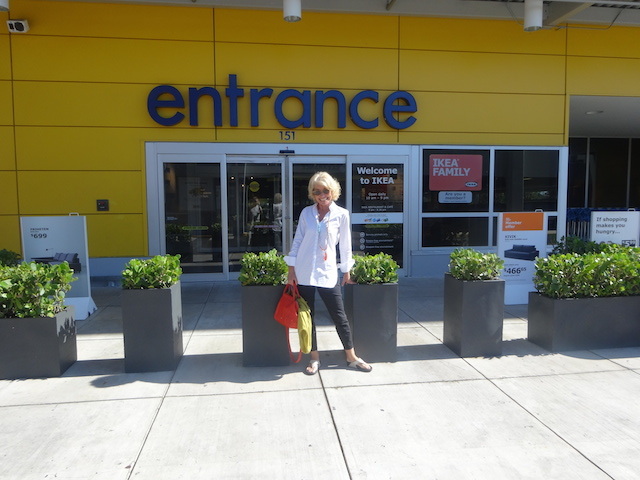 Friday we set off for the hardware stores – but first a quick trip to Ikea ! Many of you will know I am a big Ikea fan – but this time I was very prudent and only came away with 2 bags of goodies ! Happiness 1- a trip to Ikea ! Next Home Depot and then Lowes !! Then we rewarded ourselves with a late lunch at Wholefoods – chicken coconut curry, rice and a delicious selection of curried vegetables. Happiness 2 – a trip to Home Depot ! Friday night went off to enjoy Bob’s Christmas present from me – 2 tickets to the opening night of the new Bette Midler tour. It was at the Hard Rock concert venue in Hollywood FL. Such a great night – she is a real entertainer – it was a fabulous show with a brilliant band and 3 wonderful backing singers and dancers. The Hard Rock Casino right next door was a real eye opener !! – at least half of those people should have been at home tucked up in bed – not gambling and drinking the night away ! Just arrived at the Hard Rock Live venue for the Bette Midler concert …. Saturday we had a quick trip to Northern Tools – I know how to enjoy myself ! – then on to South Beach in Miami for a haircut for me, thanks to the lovely Marlene at Oribe….. We met up with Bob’s nephew for lunch and a catch up on Lincoln Road – he is a talented artist who has just had a show in Chicago and is in talks about a show in West Palm Beach and Miami. Some of you will have seen one of his great canvases in our office as well as one on the wall in Tops …..
We also took a look at one of our favorite buildings in South Beach – the New World Symphony building – just behind Lincoln Road. It is designed by Frank Gehry and we have been to several concerts there – spectacular. There is a lovely green open space in front of the hall that relays concerts and productions to people outside – projecting the concerts onto the huge front wall – such a great idea. Sunday was a more relaxing day – a late start and then a trip to the Aventura shopping mall – I think this is my favorite shopping spot in Florida. Stocking up on face creams and other essentials !! We also went to the Village at Gulfstream Park to visit the large Crate and Barrel store, West Elm and Pottery Barn. Look at the size of this darn thing in comparison to the vehicles in the front of the picture. It is at the Village at Gulfstream Park – scary !!!! Supper on Sunday was at PF Changs – Chinese style – and of course I ate way too much…..
Monday morning a quick trip for Bob to the podiatrist, drop off a few more things to Tony Poletti at Heartland Inc- our wonderful freight forwarder – then back on the plane to Governors Harbour – and a huge sigh of relief as we touch down on home soil again. Great selection of exotic display necklaces at Cargo – one of my top tips for home furnishings in Fort Lauderdale…. We love our trips to Florida – but a long weekend is plenty long enough – all that traffic and pollution – how lucky we are to be here in Eleuthera . As Dorothy said ‘ there’s no place like home ‘…….